There is famous story about King Cnut and the waves. However, most people know do not know the original version. For most people, what they might remember about this Cnut is a short story where the King goes to the seashore to order the waves from the incoming tide to stop. In addition to the many wars in which he was most particularly illustrious, he performed three fine and magnificent deeds. The first is that he gave his daughter in marriage to the Roman emperor, with indescribable riches. The second, that on his journey to Rome, he had the evil taxes that were levied on the road that goes through France, called tolls or passage tax, reduced by half at his own expense. The third, that when he was at the height of his ascendancy, he ordered his chair to be placed on the sea-shore as the tide was coming in. Then he said to the rising tide, “You are subject to me, as the land on which I am sitting is mine, and no one has resisted my overlordship with impunity. I command you, therefore, not to rise on to my land, nor to presume to wet the clothing or limbs of your master.” But the sea came up as usual, and disrespectfully drenched the king’s feet and shins. So jumping back, the king cried, “Let all the world know that the power of kings is empty and worthless, and there is no king worthy of the name save Him by whose will heaven, earth and sea obey eternal laws.” Thereafter King Cnut never wore the golden crown on his neck, but placed it on the image of the crucified Lord, in eternal praise of God the great king. By whose mercy may the soul of King Cnut enjoy rest. Historians have been a little skeptical on whether this story really happened – Henry did write this work more than a century after Cnut’s reign, and no source closer to that period mentions anything like it. Still it proved to be a good enough tale of piety to be included in later medieval works. 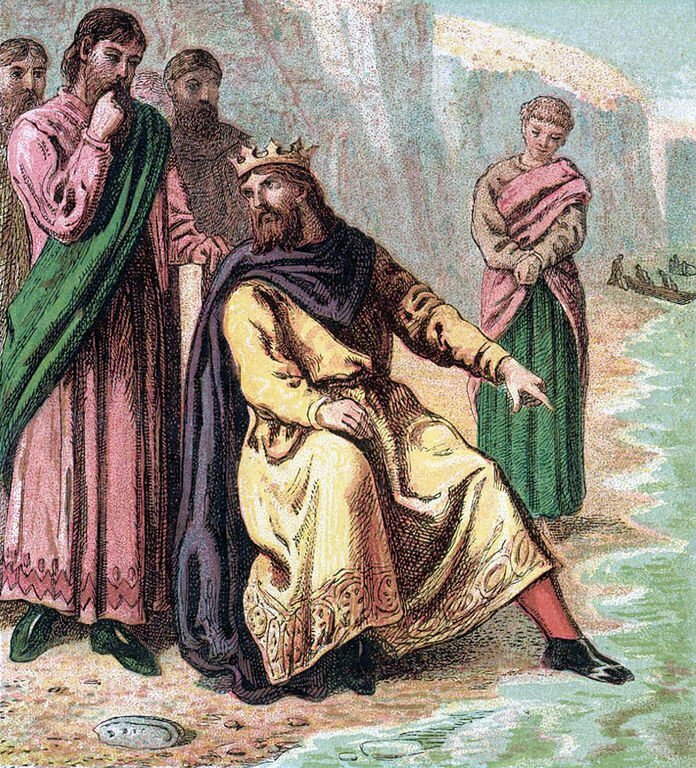 Canute, the greatest and most powerful monarch of his time, sovereign of Denmark and Norway, as well as of England, could not fail of meeting with adulation from his courtiers; a tribute which is literally paid even to the meanest and weakest princes. Some of his flatterers breaking out, one day, in admiration of his grandeur, exclaimed that every thing was possible for him: Upon which the monarch, it is said, ordered his chair to be set on the sea-shore, while the tide was rising, and as the waters approached, he commanded them to retire, and to obey the voice who was lord of the ocean. He feigned to sit some time in expectation of their submission; but when the sea still advanced towards him, and began to wash him with its billows, he turned to his courtiers, and remarked to them, that every creature in the universe was feeble and impotent, and that power resided with one Being alone, in whose hands were all the elements of nature; who could say to ocean, ‘Thus far shalt thou go, and no farther’; and who could level with his nod the most towering piles of human pride and ambition. “You are the greatest man that ever lived,” one would say. “O king, there can never be another as mighty as you,” another would insist. “Your highness, there is nothing you cannot do,” someone would smile. His officers were puzzled, but they did not dare say no. “Give the order, O great king, and it will obey,” one of them assured him. And in answer another wave swept forward and curled around the king’s feet. The tide came in, just as it always did. The water rose higher and higher. It came up around the king’s chair, and wet not only his feet, but also his robe. His officers stood about him, alarmed, and wondering whether he was not mad.